Wed, Aug 15, 2018, 10:24 pm SL Time, ColomboPage News Desk, Sri Lanka. Aug 15, Colombo: Sri Lanka's Prime Minister Ranil Wickremesinghe says the unity government is working to deliver long term peace to the island nation and religious festivals are important to promote peace and reconciliation. The Prime Minister made this observation while participating in the annual festival of the historic Shrine of Our lady of Madhu of in Mannar presided by the Archbishop Cardinal Malcolm Ranjith and Bishop of Mannar Most Rev. Emmanuel Fernando. 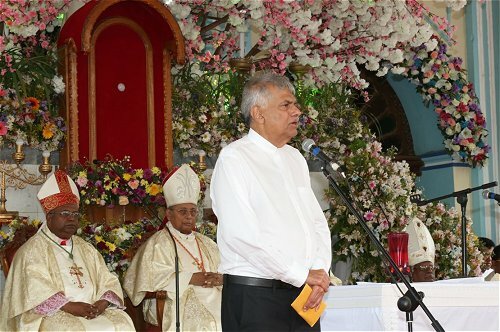 Addressing the gathering Prime Minister Ranil Wickremesinghe said the Madhu feast is a symbol of reconciliation in the country. "Our large religious festivals are important moments to promote and embrace the values of peace and reconciliation, as we work to deliver long term peace in Sri Lanka," the Premier said. The Prime Minister said that the Madhu church has been venerated by all the quarters of Sri Lankan society irrespective of their religious background and it is an important place to strengthen ethnic and religious ties. He also said that no room should be allowed for hatred to conquer the society. The Prime Minister also made a donation for the future development activities of the Shrine of Our Lady of Madhu. A number of government Ministers, officials and a large number of devotees attended the event.